North Dakota state auditor Josh Gallion gives his dissenting opinion on Measure 1. Public officials and advocating citizens from across North Dakota met at North Dakota State for a public forum on North Dakota Measures 1 and 3 on Thursday, Oct. 11. 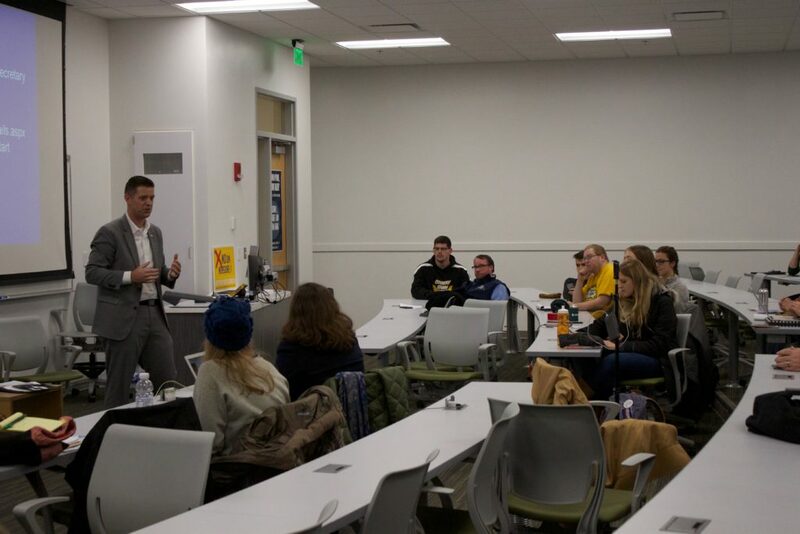 The forum was hosted by NDSU Young Americans for Liberty, College Republicans and College Democrats. Dave Owen, chairperson of Legalize ND and principle Measure 3, the decriminalization of recreational marijuana, spoke in favor of Measure 3 at the forum against North Dakota state representative and attorney Shannon Roers Jones. “One in every four people in the state of North Dakota has a marijuana charge. It is time to end the failed experiment of prohibition, which sends thousands of people to prison for no reason,” Owen said. Measure 3 would legalize the recreational use of marijuana for people age 21 or older in North Dakota as well as unrestricted and untaxed growing, distribution and sales. It would also enact an automatic expunction process for those with prior marijuana-related convictions in North Dakota. Some of the concerns that Roers Jones spoke about included how the bill would require all 177,000 marijuana convictions from the state of North Dakota to be expunged by the court system within 60 days after the vote or the state could be subject to lawsuits. According to the North Dakota Attorney General’s Office, the record expunction alone would cost the state of North Dakota $1.2 million. The total cost to implement recreational marijuana would be $6.5 million for state agencies and local governments. “What we’re asking the courts to do is expunge the records of 177,000 people who knowingly broke the law, and we’re not talking about a simple possession of a pipe or paraphernalia, we’re talking about people who could have been distributing hundreds of pounds of marijuana through the state,” Roers Jones said. With the expunction, if someone were to be arrested for a marijuana change and another charge at the same time, both charges would go through the court on the same document and could not be separated; therefore, both charges would be eliminated. Currently, recreational marijuana is legal in nine states and Washington D.C. If Measure 3 passes, North Dakota will have the most liberal marijuana law. “This measure is not fully written. This measure is about personal freedom and ending the war on drugs and creating revenue in the state,” Owen said. 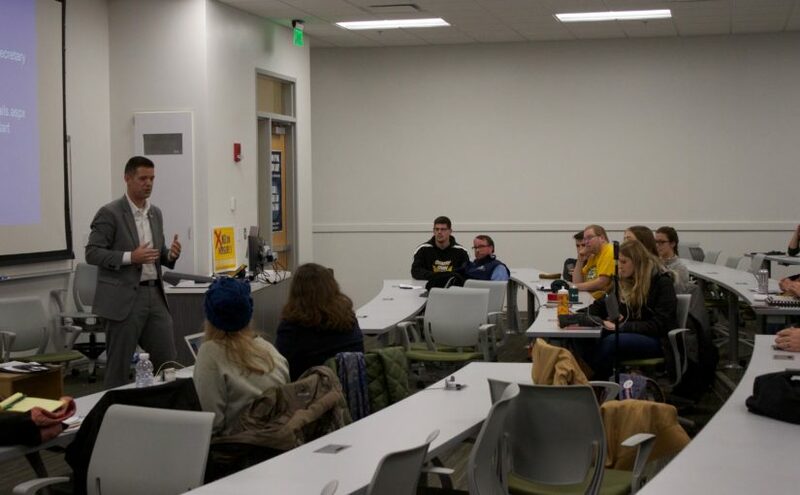 Measure 1, which if passed would create an ethics commission in the North Dakota government and ban foreign-based political contributions, was represented at the forum by North Dakota state auditor Josh Gallion in opposition to the measure. Those who support Measure 1 were not in attendance. However, they did submit a letter that was read by the moderator, Amanda Savitt. Some of the organizations that support Measure 1 are Voters Right to Know, Represent.Us and former North Dakota Lieutenant Governor Lloyd Omdahl. Those in opposition include American Civil Liberties Union of North Dakota, Bismarck-Mandan Chamber of Commerce and Xcel Energy. The main support for Measure 1 is from the organization North Dakotans for Public Integrity, which is co-chaired by Ellen Chaffee, the Democratic candidate for North Dakota lieutenant governor in 2012, and Dina Butcher, former North Dakota human rights division director appointed by former Gov. John Hoeven. So far, those in favor of Measure 1 have raised over $623,620.83 and spent $410,146.46, while those against it have raised $251,600 and spent $32,941.26, according to ballotpedia.org. Thirty-nine states in the U.S. currently have an independent ethics commission that has authority over the state legislator; seven states have an ethics commission that does not have authority over the state legislation; and six states do not have an ethics commission. Fargo’s Measure 1 was also contested at the forum. Zac Echola, board member of Reform ND, spoke for the measure against professor Mark Johnson of Minnesota State University Moorhead. Measure 1 would change Fargo’s city voting ballot from selecting one candidate to checking “yes” or “no” for every candidate, and the candidate with the most “yes” answers would receive the seat. Elections will be held Nov. 6 for all measures.